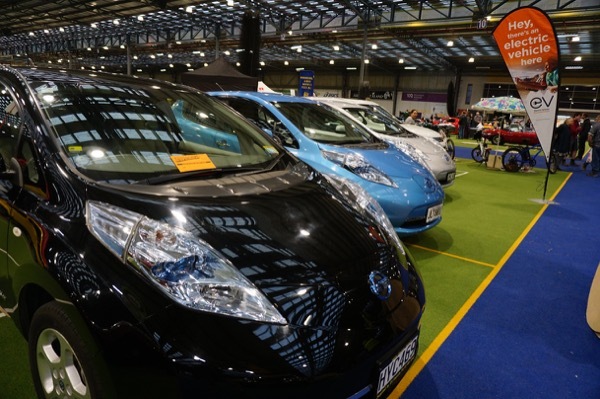 Dunedin EV Owners were invited to have a display at the Classic Car Club annual display called AUTOSPECTACULAR. We had a display with a variety of EVS including conversions. And two local dealers took a trade stand each and with only Electrics on display. These were static displays and we wanted to see how we would go as EVangelists in a traditional petrol-vehicle environment. The response was very positive. People were curious about the cars and we talked ALOT about charging! As Chelsea Sexton says the main questions were how far? how do you charge? how long to charge? how much $? how fast? Looking forward to next year already! We were going to offer test rides outside but then decided to send them to the two dealers who had trade stands for test drives. And we have four other EV owners test ride things coming up next month. Electric Vehicles are great for the environment and your wallet.